That is exactly how I see it now. What Toyota needs to do is increase their focus on the principle of the Toyota Way. The biggest failure I see is what appears to be the all too common focus on hoping you can just keep going when indications of problems crop up and hope that things get better. Respect for people, as quoted above, is looking at respect for all people in Toyota. In many other places they show that they understand Toyota’s purpose extends to respect for people everywhere. If I were at Toyota I would make sure the long term responsibilities Toyota has to society are given more weight. That and a focus on improving the practices of the Toyota Production System will get them back to the continual improvement track they need to be on. Let growth come as an outcome of doing those things well. Don’t focus on growth. Toyota, and every organization, needs to continuously maintain a focus on actually doing what is said to be important (following the Toyota Way, for example). This is not easy. It is something that has to be re-enforced every day. And re-enforced with systemic re-enforcers that re-enforce behavior in line with principles as well as systemic measures to make obvious deviations from the desired behavior and encourage a return to the desired behavior. 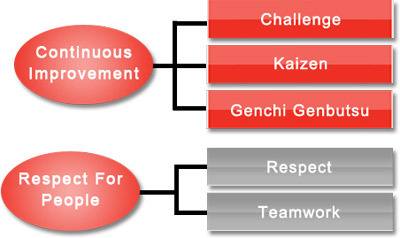 The Toyota Production System (TPS) was established based on two concepts: The first is called “jidoka” (which can be loosely translated as “automation with a human touch”) which means that when a problem occurs, the equipment stops immediately, preventing defective products from being produced; The second is the concept of “Just-in-Time,” in which each process produces only what is needed by the next process in a continuous flow. As a company, we seek to instil in each employee the desire to be more, and to achieve more. We strive to create an environment in which this enthusiasm is nurtured and encouraged, in which people are rewarded for their efforts. Challenge. This means not only embracing challenges, but also challenging what we know and do, and being prepared to change things to make improvements. Respect. This means respecting the individuality of each person within the group, respecting their contributions, their ideas, as well as their cultural or personal beliefs. It also means respecting the natural environment. At the heart of The Toyota Way is a core belief that our workforce is a critical asset and that all permanent employees should benefit from stable employment. We also believe that our success as a sustainable organisation depends on the commitment of employees who understand and work according to The Toyota Way. This is why we invest in each Toyota employee – no matter their level of seniority – via on-the-job training and the Toyota Business Practices (a Toyota-developed problem solving methodology). In this way, we can nurture their development and maximise their contribution to the organisation longer-term. TPS has only Jidoka and JIT as the two pillars. Toyota Way, as I have been told, has the two pillars you mentioned. The trick question is how is TPS different than Toyota Way? I agree with most of your post. However, Toyota has forgotten Deming’s principle that the customer is the most important part of the manufacturing process. I recently purchased a Toyota based on their cultural roots with Deming and was thoroughly disgusted by the purchasing process. Toyota’s entire management system may be 100%, but if they fail to please their customer, Deming would hold that their values are backwards. I agree Toyota has failed to manage the dealer process http://management.curiouscatblog.net/2009/06/07/penske-to-buy-saturn-from-gm/ My understanding is that car dealers in the USA have an extremely political corrupt setup. I may be wrong but my understanding is there is all sorts of political interference in allowing Toyota, or any dealer, from managing dealers. Now that doesn’t excuse Toyota from finding a way to provide a decent customer experience but I think Toyota has just given into the system (remember as Toyota was growing in the USA there were huge biases against them – even bashing up Toyotas with baseball bats in pep rally type events showing their buy American preferences). Deming Toyota have forgotten the principle that customer is in the production of the most important part. I recently bought a Toyota, according to their cultural roots and Deming and thoroughly disgusted the procurement process. For Harish, TPS is a methodology for production; the Toyota Way is a corporate philosophy on how to conduct business. They are not one in the same. It is unfortunate but dealers are independently owned and operated and not franchises. The result is that each one views their relationship with the customer differently. I believe that the design and production of the vehicles themselves are still customer driven. This is supported by the fact that even with poor dealer experiences and bad press the Camry is still the most popular car in the US.